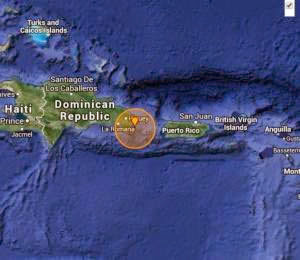 A 5.8 magnitude quake struck at 5:15 pm west of the island, according to the Puerto Rico Seismic Network (PRSN ) . After the earthquake felt in almost all Puerto Rico aftershocks have been recorded , but have not been reported as felt . There was no warning, tsunami watch or warning for Puerto Rico and the Virgin Islands because of trembling PRSN reported on its website . The quake originated about 36 miles west southwest of Mona Island , at a depth of 57 miles, depending Seismic Network . The website of the PRSN received many visits was blocked for several minutes, something that has happened in similar situations in the past. But the entity disclosed information to three minutes occurred in his Twitter account . The University of Puerto Rico (UPR ) at Mayagüez , which is attached dependency information shared by Facebook and Twitter. According PRSN the quake was located at latitude 18.1 and longitude 68.3 with , about 58.4 miles west southwest of Mona Island . For its part, the United States Geological Survey (USGS , for its acronym in English ) preliminarily indicated that the magnitude of the earthquake was 5.3 but then upgraded the magnitude to 5.8 , as PRSN . The USGS reported that the quake was felt more event in Boca de Yuma, in the region of La Altragacia in eastern Dominican Republic . Users of social networks in Puerto Rico react to seismic events and reported having felt mostly in Mayagüez , Aguadilla, Rincon, Rio Grande, Utuado , Moca , Lajas , Loiza , Guayama, Juana Diaz, Bayamon, Manati, Aguas Buenas and Orocovis between other peoples.